I always like to commemorate important events in my life through my art. And what better way to celebrate our new addition to the household, Cosmo the Cat, than to do a portrait..."Godard Style"! In this image we can see that this cat has hit it big time! 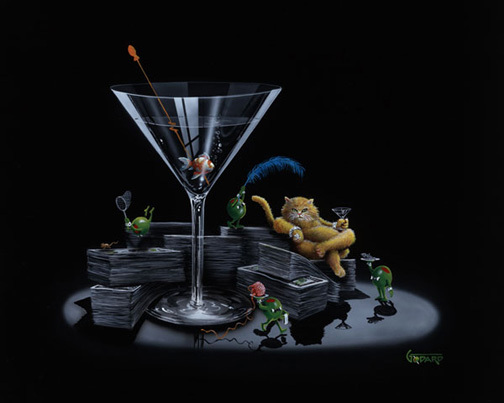 Our Olives cater to Phat Cat with fish & yarn while he sports the bling, sips a martini, and lounges on piles of money. You know you are somebody when you no longer have to chase mice yourself! The fish in the martini glass should be a bit concerned considering that not only is this cat phat, but also fat. Will one of our Olives be deep martini fishing soon?